Alpha was hosted here in 2017 and 2018. For 2019, St. Tim Church is thrilled to introduce a new faith formation program - ChristLife: Discovering Christ. St. Timothy Church hosted a vibrant, dynamic Alpha group here in our parish in 2017 and 2018. The Alpha Course is a practical introduction to the Christian faith. In the Alpha course, guests have the opportunity to explore the meaning of life in a relaxed, friendly setting. The course meets once/week for 10 weeks, and it includes a full-day getaway in the middle. Each session, people enjoy great food, laughter, and learning about the teachings of Jesus in a fun and friendly atmosphere. Here, no question about life or God is seen as too simple or too hostile. Alpha is for anyone. People attend Alpha from all backgrounds, religions, and viewpoints. They come to ask questions about the existence of God, the purpose of life, what happens after death, the teachings of Jesus, and more. Many guests have never been to church; others may have attended church occasionally but feel they have never really understood the basics of the Christian faith; others attend church regularly. Everyone is welcome at attend Alpha. 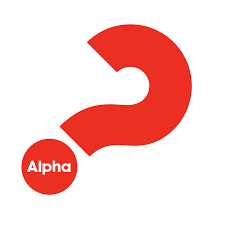 The Alpha course began at Holy Trinity Brompton Church in central London in the late 1970s as a means of presenting the basic principles of Christianity to new Christians. The Alpha course teaches only the basic biblical teachings on which all Christians agree. Alpha has spread around the world, as more churches and courses found it an effective way to answer people's questions about the Christian faith. Alpha for Catholics is simply the Alpha course hosted in a Catholic setting. Alpha is a practical tool that parishes use to inspire Catholic renewal and answer the call of Christ and His church to "go and make disciples of all nations." The Alpha course is often lay-driven and has proven to be an effective tool for awakening faith in people who are on the fringe of parish life, faithful Catholics, and those outside the faith. An estimated 16 million people have participated in Alpha worldwide. Alpha materials are printed in 83 languages. Alpha courses are currently being run in 169 countries by Christians of 100+ denominations. There is no charge to participate in Alpha.